Serena Williams vs. Venus Williams and Roger Federer vs. Rafael Nadal: two of the most iconic tennis rivalries, back to center stage for the 2017 Australian Open. None of these names are new, but their combination was completely unforeseen and remains impressive. Too often, the circuit of major tennis tournaments becomes an echo chamber of the same expectations each week as the courts change, but the faces stay the same. All four superstars came to the Australian Open on the backend of careers that have spanned nearly 20 years — their growing age enough to convince the tennis world that the four, all on the wrong side of 30, would not be able to perform well enough to compete, let alone recreate their former finalist eminence. The tennis world was wrong. Serena’s athletic statistics are hardly enough to contextualize her performance at the Australian Open. She is currently the only tennis player — men’s or women’s — to win 10 Grand Slam singles titles in two separate decades. She is one Grand Slam title behind the all-time leader, Margaret Court and is the highest paid female athlete in the world. Most importantly, Serena continues to play at a high level at an age when previous women’s tennis players had long retired. With 23 Grand Slam singles titles, Serena surpassed Steffi Graf’s 22 — though Graf notably retired at age 30 — and is second only to Margaret Court. Williams, on the other hand, now has 10 major singles titles since she turned 30. At 35, she is the oldest woman to win a Grand Slam singles title in the Open era. The Australian Open was huge for Venus, too. Formerly No. 1 in the world early in her career, Venus fell below the top 100 in 2011 after diagnosis of a rare, long-term autoimmune disease called Sjögren’s syndrome. A back injury in 2013 slowed her ascent even further. She ultimately returned to the top 10 in 2015 and entered the Australian Open against her sister as the oldest women’s singles finalist in history. Experts anticipated that her age and illness would hold her back from reclaiming her former glory, and not without reason — Venus has not won a Grand Slam singles title since 2008 — but at the Australian Open, the 36-year-old made it to the final round, proving her steadfast ability to compete. Both Serena and Venus have been No. 1 in the world for a combined 321 weeks total. They have competed in four consecutive Grand Slam singles finals, the first and only time that the same players faced off in consecutive major finals. The Plexicushion courts at the Australian Open brought such a fast pace of play that the average volley lasted just three shots, and both sisters hit some of the hardest, fastest serves in professional tennis — serves that can only be returned by another Williams sister. “I hit some big serves that would be aces 99 percent of [the] time. Not against her,” Serena said. The Nadal-Federer rivalry also has deep roots in the tennis world. Each denied the other important career titles — Nadal’s losses to Federer from 2006 to 2007 kept him from what’s known as a “Channel Slam”, which requires winning the French Open and Wimbledon in the same year. No one had done this since 1980, but both eventually accomplished a Channel Slam, and it represents just one of many examples of their interlocked successes and failures that spiral endlessly through the past two decades. Nadal struggled through 2016, playing on and off due to injury to his left wrist, while Federer had to leave Wimbledon to conduct rehab for his knee, yet neither showed any issue of fitness or health at the Australian Open. Nadal was forced to manage Federer’s faster style, with harder serves and quicker volleys, which required endless bursts of energy from both players. A singles player has just 27 feet across their width of the court, and Nadal and Federer traversed across that distance enough times to cover a total of nearly two miles. The intensity is a product of the immense challenge each player has always posed to the other. Tennis analyst Mary Carillo explained that when Federer is at his absolute best, he does not need to worry about the style or ability on the other side of the net. “But if he is playing Nadal, even his best is often not enough,” Carillo said. The high-intensity play of both matchups recreated the bold, foregone era of tennis that defined all four legends. 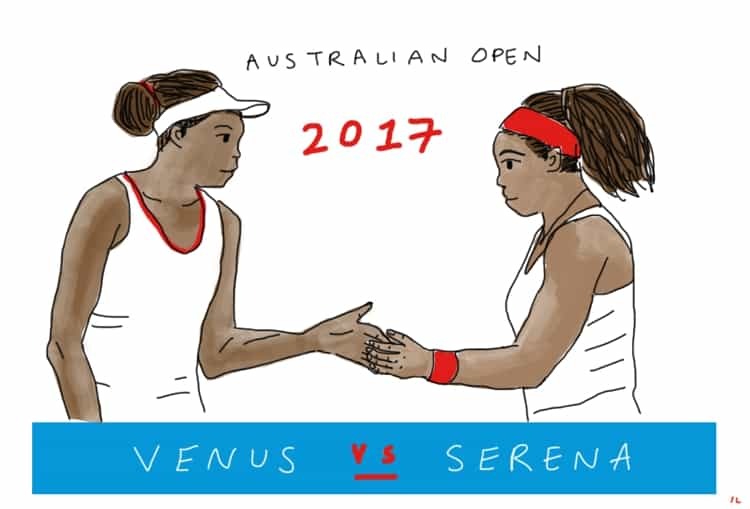 At this past Australian Open, the players themselves responded to the challenges of their respective rivals with eloquent sportsmanship that distinguished this historic matchup even further. Immediately after winning, Federer applauded Nadal in a post-match interview. “Keep playing Rafa, please. Tennis needs you. Keep doing everything you do,” Federer said. And Venus spoke of Serena’s success as if it were her own. “Your win has always been my win. I think you know that I’m enormously proud of you. You mean the world to me,” Venus said. All four faced tough odds going into the tournament. Their injuries and growing age convinced experts that they already knew the ending to each player’s story, but the 2017 Australian Open proved otherwise — that it is never too late to be a champion. Previous articleGet back out there, San Diego. The Raiders are asking about you.